Rising early we trudged our way though deep, freshly fallen snow to the station in Lauterbrunnen to take the train to Luzern. Changing at Interlaken, the train weaved its way past lakes and over mountain passes for two and a half hours to Luzern. The snow made the landscape appear in infrared, reversed black and white in the morning light. When we started to near Luzern the snow disappeared, the grass was green. Overcast skies didn’t make for pretty pictures unfortunately but we had a good wander around, loosely following the walking route in the free city guide. There were two Christmas markets, one below the railway station and another in the town. We walked up to the grand city walls but we couldn’t walk along the top of them as they were closed in winter. 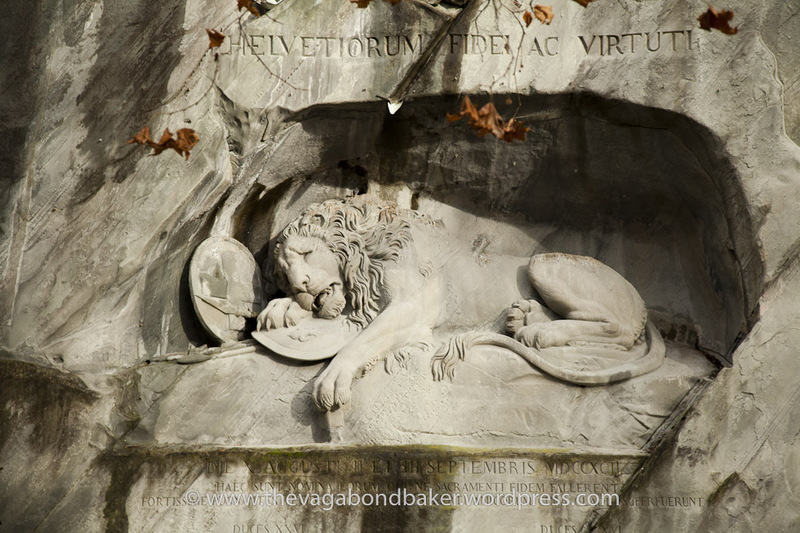 Weaving our way though the streets in the old parts of the city, we went to view the beautiful Dying Lion of Luzern monument and had a little stroll along the lakeside. 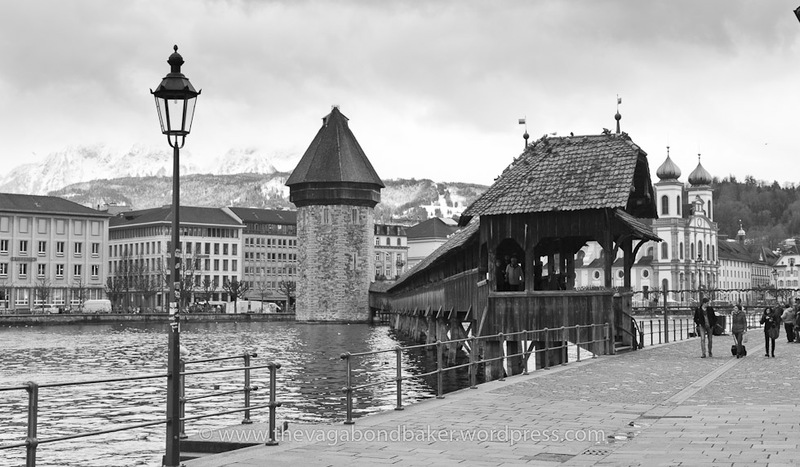 Luzern’s Chapel Bridge, one of two covered wooden bridges crossing the Reuss river, inside the roof is decorated with painted wooden panels. 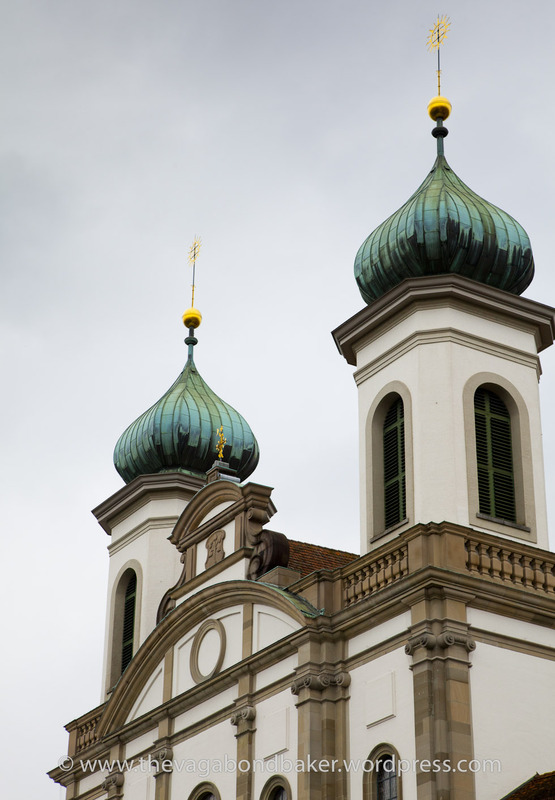 The Jesuit Church with its iridescent onions. Glorious. 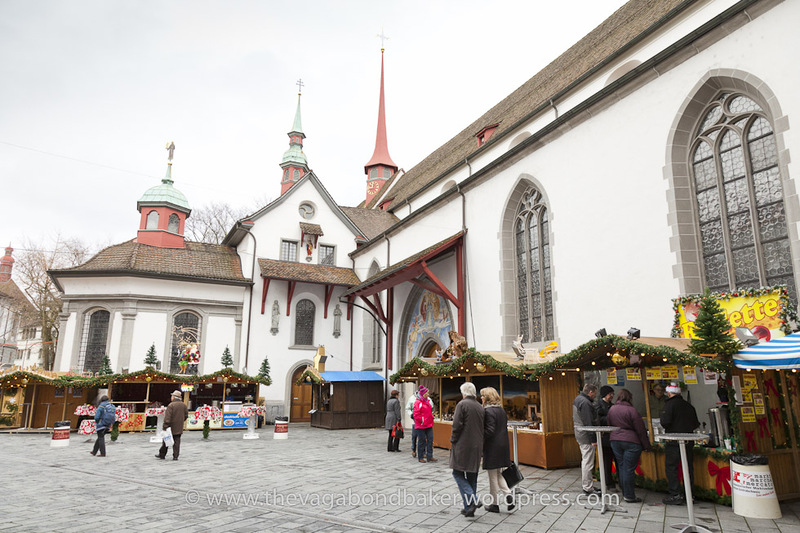 A corner of the Christmas market at the Franciscan Church, the raclette was just beginning to bubble. 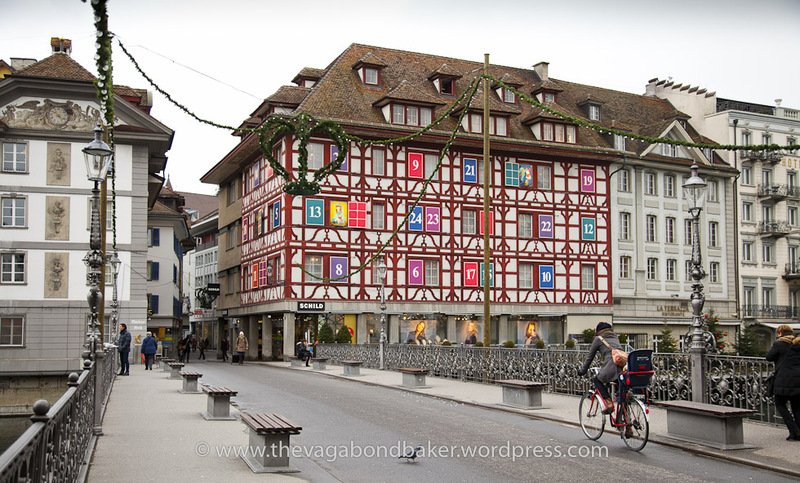 This building was just so festive, how brilliant, an Advent Calendar building! This beautiful yet moving monument was carved into the rock in the early 1800s to commemorate the deaths of the Swiss Mercenaries at the Tuilleries in 1792. The Lion is dying from a mortal wound. 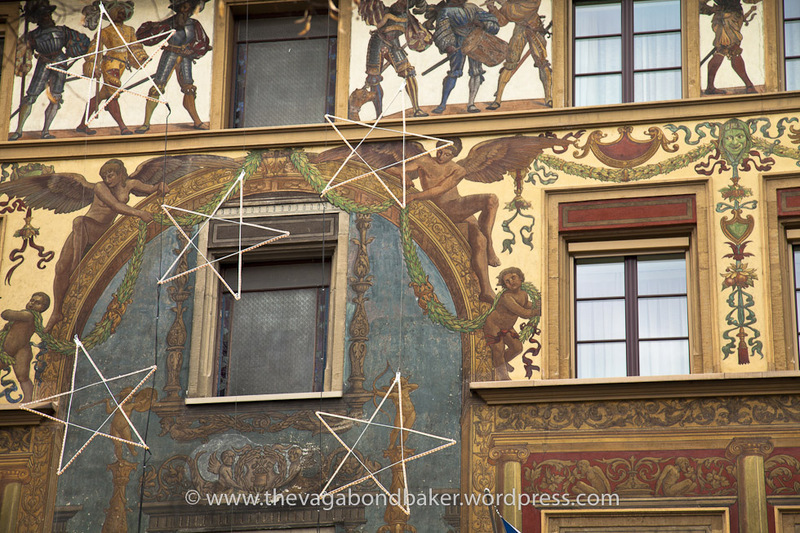 There are a number of pretty squares in the old town with elaborate frescoed buildings. This one was stunning. Another view of the Chapel Bridge, and the Water Tower, previously used as a prison, torture chamber and a treasury, which was built in the 1300s. Lucerne was a lovely day trip out from the Alps and easy to do with the Swiss trains. Bernese Hazelnut Tart a little bit of Swiss baking in a Swiss kitchen! Two Little Alpine Christmas Markets Getting festive up in the Swiss mountains. A Snowy Hike From Mürren Snow beautiful you won’t believe it! Ticking Off My #1 James Bond Location! As 007 locations go, this one is the greatest! Lovely blog post! My fave photos are the advent calendar building, the lion, and the iridescent onions. Gotta go there some day! Yes you do! In summer the bridges are festooned in flowers too, now I must go back to see that! I visited Lucerne last summer, such a beautiful place! I’ll Tweet you some pics from my trip – the bridge in particular shows quite a contrast to your winter trip! Fab photos. Love your blog! Thank you! I really want to go back in the summer to see Switzerland in bloom!